The Gift Fair is a yearly trade event at the AmericasMart in Atlanta, Georgia featuring specialty gifts and wares from around the world. 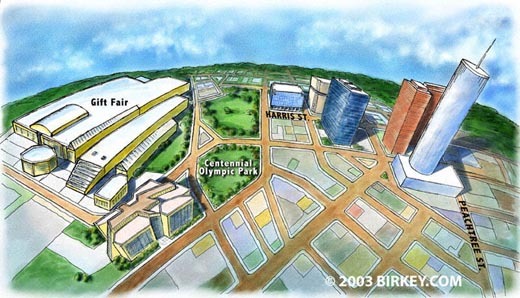 The convention promoters required a map for show attenders to help orient them to the area, in a user-friendly aerial perspective view. Randal Birkey was commissioned to produce this digital watercolor aerial forced-perspective map. The final file was delivered to the design agency and imported into standard digital page layout software for final print reproduction.